Trump instructed Senator Mitch McConnell to fight “the Wall and Border Security as hard as he fought for anything”. 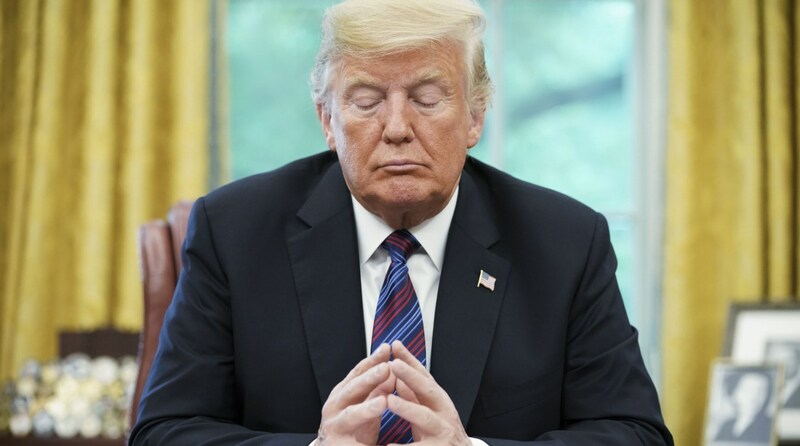 US President Donald Trump blamed Democrats for an impending shutdown if they did not vote for “border security”, referring to the proposed wall along the US border with Mexico. “Shutdown today if Democrats do not vote for Border Security!” warned Trump, in his series of tweets on the day the US Senate prepares to vote on a spending bill which seeks to approve a funding bill for the President’s border wall. “The Democrats, whose votes we need in the Senate, will probably vote against Border Security and the Wall even though they know it is DESPERATELY NEEDED. If the Dems vote no, there will be a shutdown that will last for a very long time. People don’t want Open Borders and Crime!” he said. On Thursday, the US House of Representatives approved more than $5 billion in funding for the wall, close to 24 hours before the partial government shutdown deadline. The spending bill was approved by the House on Thursday with 217 votes in favour (all Republican) and 185 against, only eight of which were cast by Republicans. The Senate will discuss the bill today, 21 December, although it is unlikely to approve it since Democrats have enough votes to block it despite being a minority. “The Democrats are trying to belittle the concept of a Wall, calling it old fashioned. The fact is there is nothing else’s that will work, and that has been true for thousands of years. It’s like the wheel, there is nothing better. I know tech better than anyone, & technology on a Border is only effective in conjunction with a Wall,” he said. The Democrats are trying to belittle the concept of a Wall, calling it old fashioned. The fact is there is nothing else’s that will work, and that has been true for thousands of years. It’s like the wheel, there is nothing better. I know tech better than anyone, & technology…..
…..on a Border is only effective in conjunction with a Wall. Properly designed and built Walls work, and the Democrats are lying when they say they don’t. In Israel the Wall is 99.9% successful. Will not be any different on our Southern Border! Hundreds of $Billions saved! “Properly designed and built Walls work, and the Democrats are lying when they say they don’t. In Israel the Wall is 99.9% successful. Will not be any different on our Southern Border! Hundreds of $Billions saved!” added Trump. “He will need Democrat votes, but as shown in the House, good things happen. If enough Dems don’t vote, it will be a Democrat Shutdown! House Republicans were great yesterday!” he tweeted. Trump, who proposed building a wall along the country’s southern border to prevent immigrants from entering the US, also instructed McConnell to use the “nuclear option”. “Mitch, use the Nuclear Option and get it done! Our Country is counting on you!” he tweeted. McConnell is the Senate Majority Leader. The nuclear option is a US parliamentary procedure Senate to override a rule – specifically the 60-vote rule to close debate – by a simple majority of 51 votes, rather than the two-thirds supermajority normally required to amend the rules. If the Senate disapproves of the bill, the government might face a partially shutdown once the current funds’ deadline expires Friday midnight. In this case, the funding will expire for agencies that control federal law enforcement agencies, airport security, space exploration and farm programmes. The Senate had unanimously passed a spending measure on Wednesday night to keep the government running until February 8 ahead of Friday’s deadline. But the bill did not include border wall money due to which the Republican President said he would not sign any bill that did not contain wall funding. Trump’s ambitious border wall is unlikely to fructify since the Democrats will take control of the lower House in January and will block the funding in both chambers. There have been two shutdowns in the US this year. The first happened in January for three days and the second in February for just a few hours.